By 1762, the Philippines was already 200 years under Spanish Rule. But something odd happened in September of that year. The British invaded Intramuros, the walled City of Manila and the center of Spanish colonial power. However, the British could not extend their rule over the entire Philippines as they lacked the manpower and ammunition to do so. So the Spanish flag still waved on the entire Philippine Islands, except in Intramuros. The following year, a young man named Diego Silang led a revolt against the Spaniards in Ilocos province, on the northern part of the archipelago. His wife was a beautiful lady by the name of Maria Josefa Gabriela Silang (march 19,1731-Sept.29,1763), or more popularly known in Philippine history simply as Gabriela Silang. Diego ‘s revolt was successful at first but was thwarted later on by fellow Ilocanos who sided with the Spaniards named Pedro Becbec and Miguel Vicos, the latter orchestrating his assassination together with the hated and dreaded Spanish priests. Diego eliminated heavy taxes and forced labor which the Spanish authorities enforced . But later these were reinstated when Diego was repulsed at one point. Diego even entertained thoughts of seeking help from the British because they promised him reforms favorable to the Filipino people. But he was assassinated ,thus ending abruptly his 33 years of existence. After his death, his courageous wife Gabriela continued the struggle for freedom. She, together with Diego’s uncle, Nicolas Carino amassed a total of 2,000 men, loyal to her husband. She led several attacks on Spanish forces , some won but others lost and with heavy casualties on both sides. After several clashes, it was over.Gabriela’s forces were overwhelmed and she was captured and taken prisoner by Spanish forces led by her husband’s assassin, Miguel Vicos. Some 90 of her lieutenants and men were hanged in Vigan and in other towns where they were caught.The rest were imprisoned or flogged. The Spanish authorities prepared a special kind of death for Gabriela’s men. Because they were the most defiant among the rebels, one by one, each soldier was hanged, lined along the coastal towns for everyone to see. Their bodies were left hanging to sway along the breeze from the sea. This was a painful reminder for all those who wish to defy the ruling power! For Gabriela, the pain was even greater because she was the last one to die. She witnessed how each of her men would go. The Spaniards said she fought like a man and so she deserved a man’s sentence! Poor Gabriela was brought to the town plaza one morning and hanged before a curious crowd of Spaniards and Filipinos, all cheering for Mother Spain, all in a festive mood, as if a hardened criminal was about to die! But the brave Gabriela, then only 32 years old, went calmly and courageously to her death. She took the 13 steps that led to the scaffold silently without any sign of fear or frustration. Thus , this woman warrior passed away, her final resting place still remaining a mystery to this day. Looking back at her life, Gabriela was a good wife, religious and caring. She was also very generous. A story told about her was that one night she was going to a sick friend’s house to bring “dinengdeng” a kind of Ilokano dish. Along the way, she met an old woman who was shivering in the cold. She gave not only the dish to this old lady but also her shawl. Gabriela is referred to as the “Joan of Arc “ of the Philippines. But, sadly she is not that well-known or highly venerated in the Philippines like Rizal or Bonifacio. Except for a group advocating women’s rights bearing her name, Gabriela is known merely as Diego’s wife and a woman general who took over when he died. She should be an inspiration to all Filipino women. She should be emulated by young girls and her true story of courage told from all over the country. She should be studied in depth in schools and given as much attention as her husband and other male Filipino heroes. In my hours of darkness she shines like a light of inspiration in my dull and uninspiring life. Gabriela Silang is a rare gem in Philippine history. 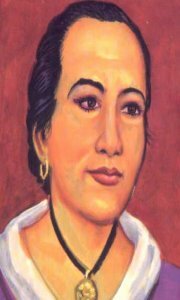 Gabriela Silang makes me proud that I am a Filipino woman!